Rd1 - Receiveing player receives at cone in sideways body position, then plays ball back to same Server. 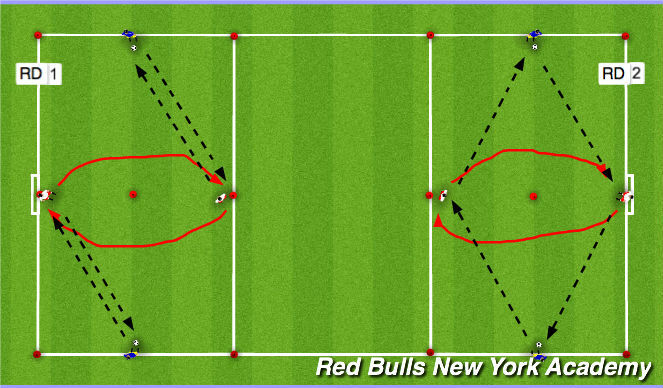 After return pass, receiving player makes a run to opposite side to receive next pass, bending their run so that they move away from the Server then back toward them as they approach the cone. Rd 2 - Receiving player opens up with first touch then plays pass to Server on opposite endline. Receiving player still receives each pass from the same Server. Makes Bending run as previous to receive next ball. Rotate positions after 1-1.5 minutes. Each player should be central receiving player 4 times (2 for Rd1, and 2 for Rd2) Requires 8 rotations. Make it a competition by counting the number of passes completed for each central player during the round. Team that begins as the attackers attempts to receive the ball off of the target players from one endline and play ball to opposite target player to score a point. If a point is scored, the attacking team retains possession and attempts to return the ball back to other target player to score again. Able to score as many points in a row as possible while maintaining possession. The defending team looks to win possession of the ball and play to either target to establish possession. 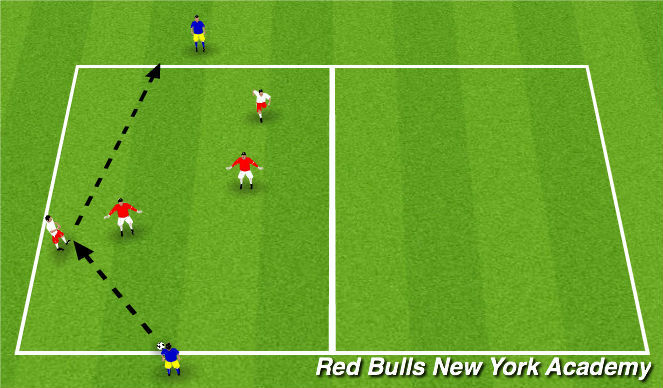 Once possession has been established, they are able to score by switching the ball to the opposite target player. Ball always starts with a Target who plays the ball out to the opposing team to attack toward the opposite goal. Attacking team must play the ball into Target before scoring.